BitCoin is a much bigger deal than we thought. In the new book, “The Age of Crypto Currency,” by Vigna and Casey, two veteran Wall Street Journal reporters, we learned that Bitcoin is used all over the world where banking is a problem. An Afghani teenager, for example, traded her Bitcoins for an Amazon gift certificate and bought her first laptop. Without Bitcoin, her earnings would have disappeared into her father or brother’s bank account. In Mali refugee camps, people receive Bitcoins as text messages on $5 phones. Without crypto currency, workers often have to depend on strangers to carry money back home to relatives. 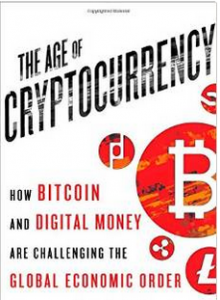 “The Age of Crypto Currency,” $28 from St. Martin’s Press, also gives us a concise history of money. In so doing, they show how Bitcoin might eventually be a more stable currency than what we use now, hard as that is to believe, because it gets government out of the equation. The book had a big write-up in the Economist magazine and is getting rave reviews.